"The farmers won't save the world, Monty. The warriors will." Will they, though? I mean, really... people only seem to make a mess of things and that seems especially true in this verse. Monty desperately tried to give Wonkru an option that didn't mean countless more dead bodies. And he was right. They could've lived off the algae hydrofarm watchmahoozit. He gave them an option and plenty seemed more than ready to take it. Too bad Octavia wasn't here for it, huh? She didn't miss a beat taking the option out of play. But why? The simple obvious first thing I thought of was that she is stuck in a loop of who she thinks she has to be now. The Red Queen. And she can't break out of the role she's playing. 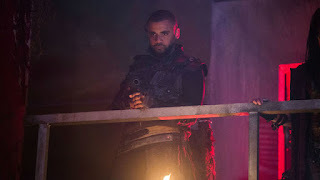 The more we see though, from her trying to talk Kane into fighting for survival at the beginning of the season to her giving Bellamy the keys to Indra's weaknesses, says that there is more to this story, right? She isn't as committed to her hard and fast rules as she forces her orobator to think. Hell, maybe it's even simpler than all that and she just needs an army to follow her every whim in order to feel like she hasn't lost her power. Probably not, though. Let's be honest. The key to Octavia's new found insanity has to be in the dark year. I have a theory that the Millers and Nylas have given Lady O their blind loyalty because they were privy to whatever happened in that year. That those that would defect don't know whatever it is that Octavia had to do to ensure survival. Of course, that breaks down as soon as I remember that Kane and Indra and probably Gaia too would have been in the know. I have a tiny bone to pick with Bellamy. I hated him telling Octavia that she was about to do something that she couldn't come back from. This is the guy who worked with Kane and Jaha after they orphaned him. He worked with Pike after Lincoln was sacrificed in the dirt. He forgave Echo for... well, everything she's done. A man of infinite forgiveness shouldn't tell his sister that there is a point at which he'll no longer have her back. I call it a tiny bone though because knowing him, he would end up letting her off the hook eventually. Clarke reuniting with her mom is the only other blood relationship we have (I think?). Abby's continued struggle with addiction was heartbreaking and very beautifully shot. I can only imagine it's going to get worse for her when mother has to answer to daughter. And even worse still if Clarke finds out what happened to Raven... if she finds out how easily manipulated Abby has become. 4 out of 5 terribly aimed assassination spears. Becca was burned to death. Yikes. I enjoyed Octavia wondering why Monty wasn't working on a plan to break Bellamy out of prison. Clarke and Madi arguing about the flame reminded of a teenager refusing to remove a piercing that their parent didn't approve of. Is it crazy to think that if the coup went so public that Octavia might've buried it despite her many warnings? Octavia looking at her dirty reflection in a broken mirror was heavy-handed symbolism. Maybe even an omen of where she is headed? Those worm eggs are going to come back and haunt us, aren't they? Ick. Ugh, and while we're here. Vinson like to Mike Tyson people. Double ick. Indra: "If you put us in the arena, I won't be losing a daughter. Gaia will win. I will have her take my life right after I take your brother's." Bellamy: "There's no coming back from this, O. If you do this there's no coming back." Madi: "Commanders don't run away." Clarke: "It's a good thing you aren't a commander." Sure, Clarke, keep telling yourself that. Octavia justs wants to get the hell away from the bunker. But why? I feel like we're on the edge of learning a seriously painful why. I got the feeling Bellamy was cautioning Octavia that if she proceeded with her plans that she would be changing herself in a way she couldn't come back from. That she would never be able to forgive herself afterwards. He was cautioning her not to go further down that path. But, Octavia has already passed that point. She told Bellamy that she was already dead. Whatever happened during their dark year pushed her past there already. I was so angry when Octavia destroyed the hydro farm. How stupid and short-sighted. No matter how lush Shallow Valley is, having a back-up food source should be common sense. If nothing else, just in case they lose. Also, Monty had apple tree shoots. I haven't noticed many fruit trees in Shallow Valley. I suppose Octavia thinks that Wonkru deserves the Valley the most because of what they have gone through, and she wants to give it to her people. I don't think she wants power for power's sake, but she definitely won't remove her blinders. Two side notes - Did you notice that Henry Ian Cusick directed this episode? And - During the episode, I was just thinking about how Marie Avergopoulis (?) has grown in this role. Remember in the first episodes when Octavia was just the silly girl jumping in the water to swim? I don't know....The 100 is starting to wear on me. Maybe I am more interested in seeing the details of the last 6 years rather than just trusting TPTB that the "dark year" was horrendous and that all the other changes in "my people"/"my family" etc are warranted. Every season its "us against them" and what price is everyone willing to pay to have "their people" be the ones that survive. No one seems invested in the survival of humanity in general...just THEIR people. I suppose this is how it would really go, since human beings are, well, human. So I'll keep watching and keep reading. Thanks for the reviews, Laure. Many moons ago, I'd read a Raven loving reviewer ask what Lindsay Morgan would've done with the part of Octavia. At the time I thought it was a pretty interesting thought and sort of went down the rabbit hole of how the show would be made different by taking out or exchanging characters. But that's possibly it's own discussion. More to your point, I can no longer see anyone else playing Octavia better than Marie Avgeropoulos. She's grown with and finessed that character beautifully. Burning that farm was more of a no coming back from it move then the arena fight. I wonder if the writers want us to want Octavia dead and then they'll save her at the last minute of the finale just to defy expectations. Being smarter than Clarke is damning Madi with faint praise at this point.